We, as skaters, burn through shoes with a quickness. Ambush Board Co. understands that. Enter the Multi-Shoe Incentive Program. If you get two pairs of shoes at once, you automatically save 10%. If you get 3 pairs, you automatically get 15% off. 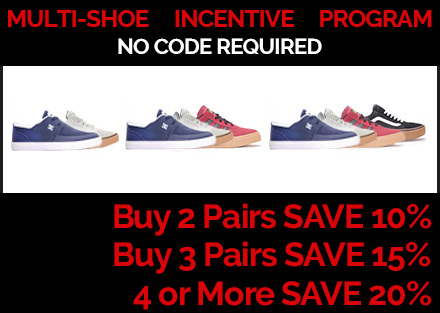 And...if you go all out and get 4 or more pairs, you save 20% right off the rip. No coupon code required, no BS. This program includes all shoes and sandals, even those that are already on sale. Buy More, Save More, Skate More.